First off, welcome to Pillsy! When you first open the app we try to keep things pretty simple and we would encourage playing around before following along here, but if you're a little stuck then here is your in-depth guide to getting all setup! Step one is downloading the Pillys app which can be found on the App Store and Playstore by searching for 'Pillsy'. 3. Click 'Get started' to begin the setup process. On the next screen we need to split users who have a Pillsy Smart Cap from users who don't because the setup for each is a little different. 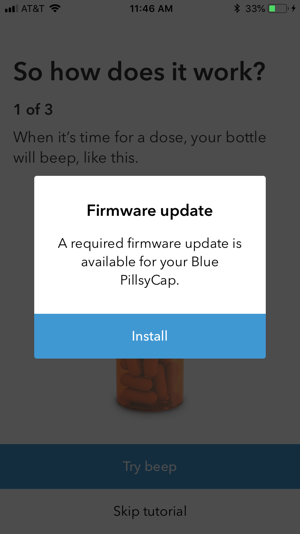 If you own a Pillsy Smart Cap then this is where you'll want to connect the cap to your phone, so make sure it's on hand! 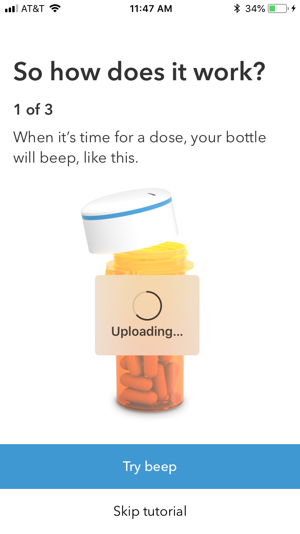 If you don't own a Pillsy Smart cap then click 'Track manually instrad' and skip to step 7 where we'll cover using the standalone Pillsy app as a reminder tool. 4. Click 'Next' and following screen tells the app to start looking for a Smart Cap to pair to. While the screen says 'Scanning...' at the bottom, wake up your Smart cap by removing it from the bottle or pressing the plate under the cap. 5. Your cap should beep when the plate depresses, this means the cap has awoken from 'sleep' mode. When you connect, the cap will sound a jingle confirming that it's connected. 6. 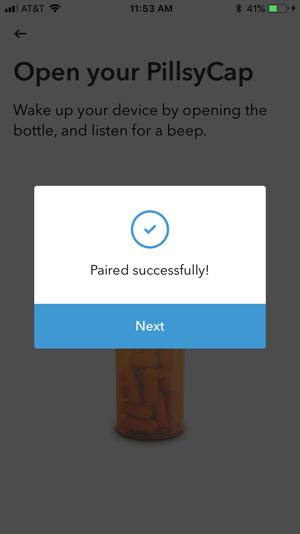 On the pop-up that says 'Paired successfully!' click 'Next'. 7. There's a good chance the next screen will say 'Firmware update', make sure you click 'Install' here and then 'Begin Update' on the next screen. We're regularly pushing out updates to improve user experience and add features, so without this update you may experience bugs! 8. After you click 'Begin Update' a loading bar will appear, this should take about a minute. 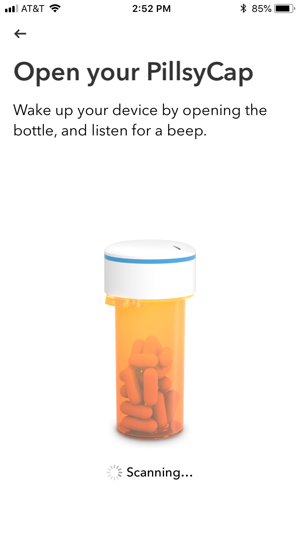 With a cap updated and connected to your phone you're ready to setup a drug! 9. If you're following along with a cap read through the next couple screens, clicking 'Next' and then finally 'Got it! ', this is setup information that could be useful to you. 10. 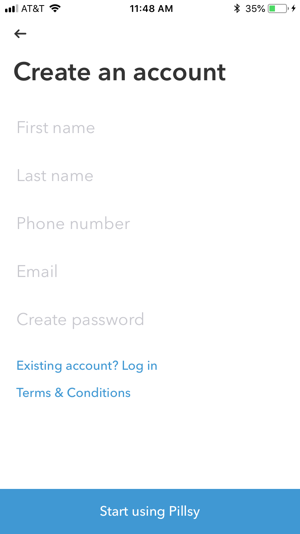 The next screen, 'Create and account', has you do just that- create an account! 11. Provide your account information: First name, Last name, Phone number, Email, and Password. 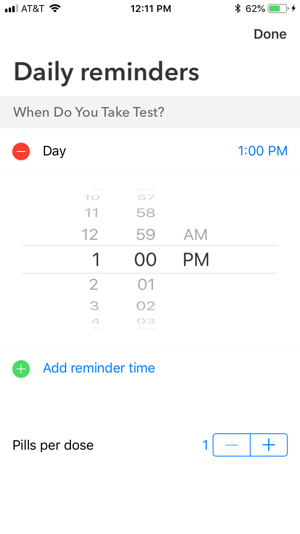 Your email acts as your account login, your phone number lets us send you text and call reminders- a feature you can disable! When you're finished, click 'Start using Pillsy'. 12. 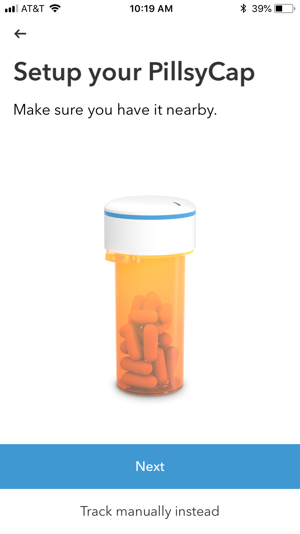 At the bottom of the following screen, click 'Enter pill info' if you're connecting with a cap or 'Add pill' if you're tracking manually. At the 'Add Pill' screen, name the Medication or Vitamin and use the drop down to autocomplete for common drugs. 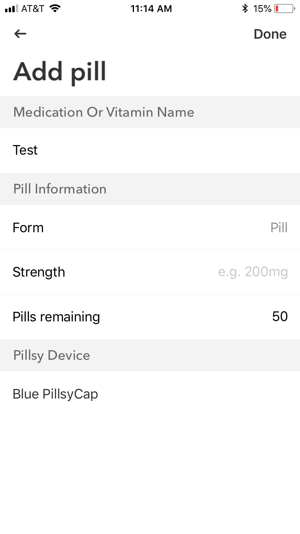 After a drug name is set a few fields pop up: under 'Pill information' change the dose format by clicking on 'Pill' next to Form, give the strength of the pill, and set the number pills remaining. 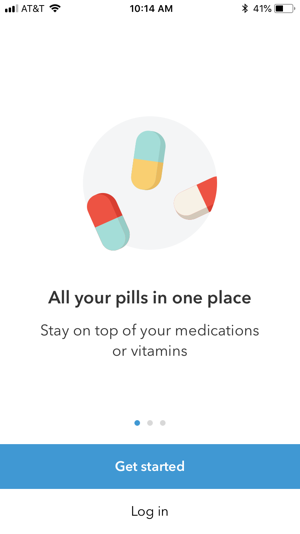 This will let you keep track of how many pills you have remaining from the app. When you're finished, click 'Done' at the top right'. 13. 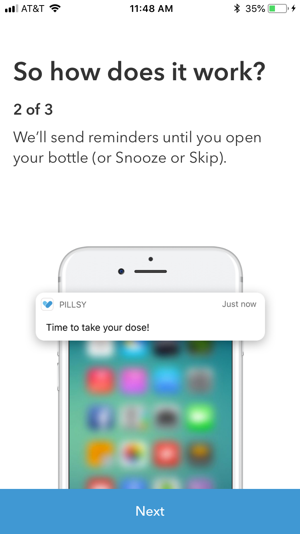 The next screen, 'Daily reminders' lets you apply a reminder to the drug. Each time you click the green 'Add reminder time' icon you'll add a new daily reminder to the drug. Set the time of day you plan on taking your drug, then, at the bottom, set the number of pills you'll be taking each dose. When you're all finished, click 'Done' at the top right. 14. 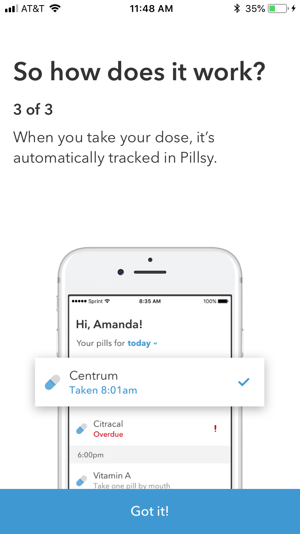 The next screen, 'Welcome to Pillsy' lets you know you're all set, click "Let's go" to move on. 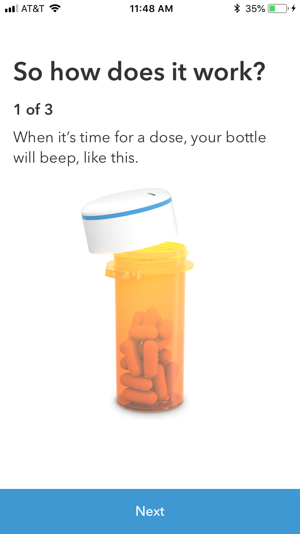 If you're using a Smart Cap to keep track of doses then each time you open your bottle your phone will mark mark your pill as taken. It's important to remember that the app needs to be up in the background on your phone for it to stay synced. 15. 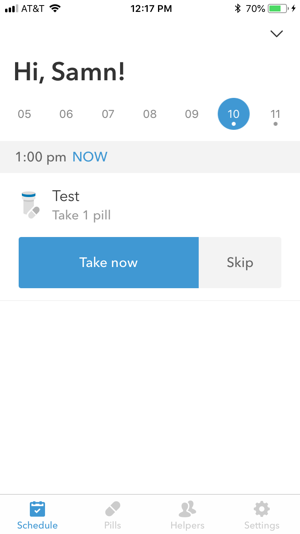 If you're not using a Smart Cap, or even if you'd like to mark a dose as taken through your phone instead of the cap, you can do so through the 'Schedule' tab. Just click on the drug and a pop-up appears with the option to 'Mark as taken'. You're all set, thank you for choosing Pillsy!